Today at a Goldman Sachs Technology and Internet Conference, Apple CEO Tim Cook gave a keynote presentation in which he addressed working conditions at Apple’s factories in China, as well as the product philosophy of Apple, the future of the tablet market and the increase in iCloud adoption. He expounded at length on just a few questions from the moderator and displayed a relaxed, but passionate personality that demonstrated exactly why he was chosen by late founder Steve Jobs to take the reins of his beloved company. It has long been known that Cook is a gifted and intelligent supply chain man. His efforts are behind the insane differential between Apple’s supply and manufacturing spending and its profits. He has also managed to trim the company’s standing inventory so much that the product almost flows directly from the factory and into consumer hands. But many weren’t convinced that this was enough to follow the legendary Jobs. Because Jobs was so intensely involved in product decisions and seemed to have an almost inhuman sense of what paths to follow and which to let lie, the bar has been set insanely high for Cook. As his appointment and the passing of Jobs made waves, fans and journalists alike wondered just how well Cook would be able to shepherd product development. How would this ‘bean counter’ be able to make products that felt as good, as ‘obvious’ as the iPhone and iPad? The talk, which you can listen to here, is a simply prime example of why the company is in safe hands. Two segments that stood out to me, among many others in which Cook riffed, poked fun at rivals like Samsung and made jokes about throwing a ‘toga party’ with Apple’s billions, were the bits on the Apple TV and the iPad. 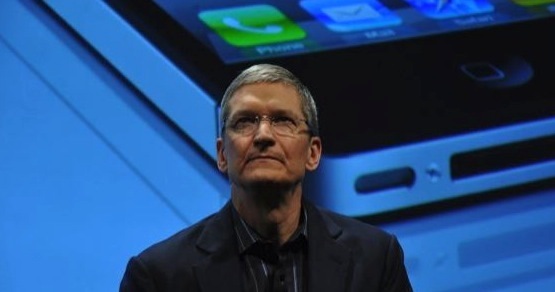 During the talk Cook said that, before the iPad was available to the public, the company began using it and loving it. I’ve actually heard this from other Apple employees as well, that within days of the iPad being available to them, executives began showing up to meetings carrying the tablet rather than their previously beloved MacBook Airs. When asked about Apple’s plans for the set-top box, Cook expressed his love for it in passionate terms, saying that its status as a hobby wasn’t due to it not being loved, but that it resides in a very tough market segment. What’s so interesting about this section is how Cook refers to the process of investigating the product. He talks about following ‘our intuition’ and ‘pulling the string’. His use of that phrase, which was remarked on by Macworld editor Jon Seff, was interesting to me as well. ‘Pulling the string’ is an exploratory concept based on unraveling a loose string on a piece of clothing until it falls apart. Although it was used colloquially by Cook, I feel that it shows his willingness to pursue the concept of the Apple TV and why the relatively small amount of people that do like it, really like it. The fact that he is willing to pull that string until Apple figures out why the “customer satisfaction is off the chart” and how to give them more of that speaks very much to his ability as a product manager. We’ve always known Cook could count the beans, but now we’re seeing the passion that he has for the product and the willingness to be patient until something is done right that we want in the person deciding the shape of future Apple products. This is the guy that Steve saw, the reason that he appointed him in the first place, amidst cries and worries. At first a phrase like “we need something that could go more main-market for it to be a serious category,” seems like a CEO being coy about the future plans of his company. But looking at it from the angle of someone who wants whatever television product that Apple creates to be well and truly good, it’s incredibly comforting. Cook is saying that, until Apple can provide a category defining experience, it’s simply not going to do it at all. Whether its ‘contribution’ to the television market will be this year or next year or some point in the future, who knows? It seems Cook took away something about fanning the flames of speculation from Jobs as well. Regardless, the man that we saw speak about Apple’s care for the welfare of its workers, its love of its products and its desire to make them the absolute best that they can is the guy that I want in charge of Apple. This Tim Cook has always been there, but here, in the full light of day as the solo CEO of Apple, we are finally seeing it too.